All meals onboard Indian Pacific, FREE beverages throughout your journey, FREE toiletries kit, Cabin Steward service, in-cabin music and commentary, use of ‘Outback Explorer Lounge’. The best time to visit Perth is undoubtedly during wildflower season, where the landscape erupts into magnificent colour. Travel to WA during September, October or November with this package to experience this remarkable natural phenomenon. There are more than 15,000 species of wildflowers throughout WA - many only found here - such as clusters of splendid rare orchids in the south, prolific inland carpets of everlastings as far as the eye can see to colourful roadside kangaroo paws. Book now to save. Meet and Greet Personalised Arrival Transfer, 3 Nights Gold Service Cabin on the Indian Pacific (2 Nights ex Adelaide), 3 Breakfasts, 3 Lunches, 3 Dinners, Luxury Broken Hill Coach Tour, Luxury Adelaide Coach Tour (Sydney to Perth customers only), Meet and Greet Personalised Rail Transfer, Overnight Perth Accommodation. Breakfast, Luxury Coach Tour with Hotel Pick Up, Overnight Perth Accommodation. Experience the coastal scenery and beautiful surrounds of Albany, jagged granite outcrops, giant forests and magnificent National Parks, the ocean offers excellent fishing, diving and whale watching opportunities, immerse yourself in Albany's proud and emotive history on a visit to the National ANZAC Centre which honours the memory and sacrifice of the WWI ANZACS. Your friendly driver will pick you up in the comfortable air-conditioned luxury coach before sharing experiences, fascinating facts and enchanting stories in the on-board full commentary throughout the day. Travel South towards Albany and pass the Stirling Ranges and Porongorups. Enjoy a special winery lunch before continuing to mount Clarence and the ANZAC Memorial Centre. Enjoy a self guided tour of the ANZAC Centre this evening before taking a scenic drive along the coastline. 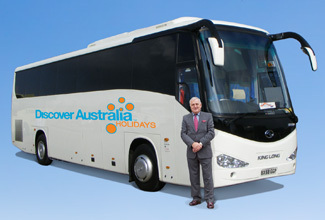 Luxury Coach Tour with Hotel Pick Up, Winery Lunch, Wine Tastings, ANZAC Memorial Centre, Overnight Albany Accommodation. The town of Pemberton lies amid spectacular surrounds, green rolling hills, enchanting vineyards and giant Karri forest, the stunning terrain offers chance to bushwalk, canoe, fish and swim, the town lies on the famed Bibbulmun Track which winds through scenic forest trails, nearby Gloucester National Park is home to beautiful cascades and rivers. After breakfast, visit Whaleworld Interpretation centre for a self guided tour before visiting “The Gap” and “Natural Bridge”. Continue to Walpole where you will join your local guide for a lunch cruise along the Nornalup Inlet. Next, you will visit the famous Tree Top Walk in the Valley of the Giants which reaches 40 metres high into the forest canopy before checking in to your Pemberton accommodation for the night. Breakfast, Whaleworld Interpretation Centre, the Gap, Natural Bridge, Luncheon Cruise, Tree Top Walk, Dinner, Overnight Pemberton Accommodation. Enjoy a short stroll to Beedelup Falls before heading North through the Boranup Forest where you have the chance to climb the magnificent 61 metre tall Gloucester Tree. Tour to Australia’s most south westerly point, Augusta and visit the Cape Leeuwin Lighthouse where the Indian Ocean meets the Southern Ocean. After lunch, enjoy the coastal views from Surfers Point Lookout and then continue north to Mammoth Cave. Later, experience an Australian sheep dog and shearing demonstration at Yallingup Shearing Shed. Enjoy free time this afternoon to explore the local surroundings. Breakfast, Gloucester Tree, Cape Leeuwin Lighthouse, Lunch, Shearing & Sheep Dog Demonstration, Dinner, Overnight Margaret River Area Accommodation. Following breakfast, enjoy some free time in Margaret River township before visiting the chocolate and cheese factories (time permitting) to sample some of the delicious produce before a wine tasting at a local winery. After lunch, travel to Canal Rocks to see the dramatic coastline before stopping in Busselton to see the longest wooden jetty in the Southern Hemisphere. Arrive in Perth late this afternoon. Breakfast, Chocolate & Cheese Tastings, Wine Tastings, Lunch, Busselton Jetty, Overnight Perth Accommodation. Enjoy your Special Buffet Lunch today with the best views in town as you cruise between Perth and Fremantle along the beautiful sparkling Swan River. The impressive hot and cold buffet selection covers a wide range of tastes, including continental meats, Australian prawns and a mixed variety of gourmet salads all followed by a cake and dessert choice. You have unlimited tea and coffee, along with a complimentary glass of wine, beer or soft drinks. Learn from the Captain's informative commentary onboard the 2.5 hour cruise is on the calm river waters. See Perth's impressive Bell Tower, Kings Park, Royal Perth Yacht Club, the restored Swan Brewery and the magnificent 'millionaires row' homes overlooking the river and Fremantle's busy inner harbour. This special river cruising and dining experience will be a highlight of your trip. Breakfast, Special Lunch Cruise, Overnight Perth Accommodation. A short ferry ride from Perth or Fremantle, Rottnest Island is a wonderland of white sand beaches, pristine bays, stunning scenery and is a haven for wildlife, spot for quokkas, wallabies and dolphins, walk the Wadjemup Trail, hire a cycle, enjoy a free guided walking tour and swim and relax at a choice of 63 beaches and 20 secluded bays. Get picked up from your hotel and transferred to Hillary’s Boat Harbour for morning tea. Embark upon the ferry and discover Rottnest in your luxury coach. Enjoy lunch at Rottnest Lodge before being returned to your Perth accommodation in the evening. Breakfast, Hotel Pick Up, Morning Tea at Hillary’s Boat Harbour, Return Ferry to Rottnest Island, Special Lunch, Rottnest Island Luxury Coach Tour, Overnight Perth Accommodation. Your special overnight Luxury Coach Touring includes all meals. The luxury vehicle has a personalised air-conditioning, a video system and an onboard toilet. You will be personally met by a DISCOVER AUSTRALIA representative and transferred from the airport to the railway station. You will also be met at the train station on arrival in Perth and transferred to your hotel. You will be personally met at your hotel by a DISCOVER AUSTRALIA representative and transferred from your hotel to the airport for your flight home. 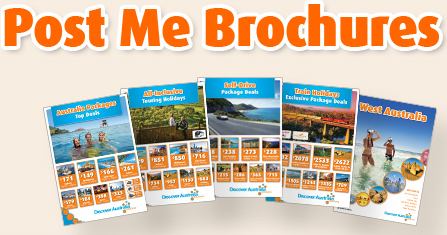 Adelaide: Choose from a selection on included tour options. Kalgoorlie (Perth to Sydney): Experience a thrilling tour of the world’s largest single open cut mining operation. Rawlinna (Sydney to Perth): Disembark to enjoy a traditional outback lamb roast, under the wide Nullarbor skies. The indulgent Platinum Service cabins are nearly twice the size of Gold Service cabins and come with premium fittings. The large panoramic windows give you the best seats onboard the Indian Pacific plus you have an interior window to give you views of both sides of the train at the same time. During the day, your cabin will be configured as a private lounge, with deluxe lounge seating, a table and two ottomans. By night, it is converted to a comfortable bedroom, with either a double bed or twin beds. Platinum Upgrades start at $1250 per person. All packages can be upgraded to include luxurious Platinum Service, simply ask. 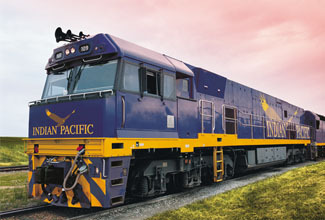 The Indian Pacific with Perth, Margaret River & South Luxury Touring is very popular. Many dates book out well in advance, please book soon.